What Is Toxic to Parakeets? Keep your parakeet chirping happily by knowing what can be toxic to him. Even the most innocent-seeming household items can make your parakeet sick. The prettiest plants and sweetest perfume can give him tummy aches, diarrhea and, in some cases, even cause death. Some foods, plants, metals, chemicals and fumes are highly toxic. Sometimes just brushing up against an item can cause a reaction. Check your home for foods, plants and items that could harm your little one, and before you bring in anything new, make sure it's safe for him. Some foods are very toxic to budgies, including avocados, mushrooms, chocolate, tomato leaves and stems, uncooked beans, raw peanuts, curry powder, sage, walnut hulls, almonds, yucca, and the pits and seeds of many fruits, including apples and nectarines. The fruit is fine to eat; just cut away fruit that is next to the pit. Some say peaches and plums can be toxic, while others say they are safe. Other foods are okay in small amounts, but can cause problems in larger quantities, such as spinach, chard or beet greens, onions and garlic. Avoid giving your parakeet salty or sugary foods, junk foods, soda, caffeinated beverages, and alcohol. Numerous plants are toxic to parakeets, or could be toxic if they chew them in large quantities. According to Budgieplace.com, these include amaryllis, azalea, belladonna, Bird of Paradise, nightshade, bracken fern, buttercup, cacao, caladium, calla lily, castor bean, clematis, coriander, daffodil, delphinium, dieffenbachia, elephant's ears, eggplant, euonymus, fava bean, figs, foxglove, andromeda, mountain laurel, rododendron, hemlock, hemp, holly, hyacinth, hydrangea, iris, ivy, impatiens, jack-in-the-pulpit, jasmine, Jerusalem cherry, jonquil, juniper, many types of grasses, lily-of-the-valley, larkspur, locust, marijuana, milkweed, mistletoe, morning glory, narcissus, nettle, nightshade, oak, oleander, peony, periwinkle, poison ivy/oak/sumac, poinsettia, poppy, primrose, scarlet bean, sorghum grass, sweet pea, taro, tobacco, tomato, trumpet vine, tulip, Virginia creeper, wisteria, yew, zebra plant, acorns, holly, honeysuckle, asparagus fern, Kalanchoe, marigold, begonia, oak, boxwood, nectarine (seeds and wood), oleander, cactus, rubber plant, shefflera, shamrock, Easter lily. The pits, seeds, leaves, roots and bark of apple, apricot and cherry trees and elderberry, and also the leaves and stems of most beans are toxic, as are the sprouts, berries, leaves and green tubers of potatoes. 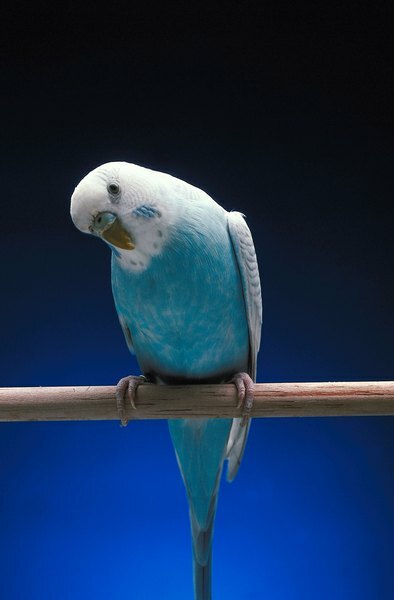 Assume that all cleaners and chemicals are toxic and should be kept away from your parakeet. When using them, move him into another room and close the door. Avoid using aerosol sprays, including fragrance and deodorants, around birdie, for his delicate respiratory system is sensitive even to slight amounts of droplets in the air. If you enjoy the ambiance of candles, plug-ins and potpourri, move his cage away from the area where you're using them. Some paints and glues are toxic -- perhaps most -- so assume they are unless you know otherwise. NOTE: The non-stick coating on many cooking pans is highly toxic to birds, especially a small bird like your parakeet. A smoking pan gives off a large amount of toxic fumes, but even cooking under normal conditions with such pans is dangerous to him. Society got along without them for generations, and you can too. Birdie's sensitive skin can react negatively to heavy metals, such as lead, zinc, copper and brass. It's not a problem if he's a homebody and doesn't come out of his cage. If he likes to come out and wander, however, replace any items made of these metals with safe metals, like stainless steel, iron and ungalvanized tin. If you like to bring in natural branches for your parakeet to use as perches, steer clear of branches from apricot, arbutus, ash, peach, plum and red cedar trees. Trees that are questionable -- some say they're toxic, others say they're safe -- include apple, peach, prune, cherry and mountain ash. Ask your vet's advice on these or avoid them to be safe. It's recommended that you disinfect even safe woods by wiping them with a bleach solution of three-fourths cup of bleach per one gallon of water, then bake them in the oven at 200 degrees until they are dry. How Hard Is It to Take Care of a Parakeet? What Is Poisonous to Parakeets?